2/7/2018- MONTGOMERY, AL– The facility, Kinpak, Inc. is a subsidiary of Ocean Bio-Chem, Inc. which manufactures and distributes a large variety of appearance and maintenance enhancing products for the marine, automotive, RV and home care industries. Kinpak itself produces products for oil companies and consumer goods retailers. Their facility in Montgomery, Alabama consists of over 300,000 square feet of manufacturing space. They had a growing need for additional office space but did not want to lose any of their current storage space. This modular inplant office’s installation would be the first ever on-site installation for our new Installation Manager, Mair Costa. Although new to Panel Built, Mair had a great deal of experience in the construction industry and with overall project coordination. With it being Thanksgiving weekend, there were unexpected delays while the materials were in transit, causing it to get to the site a day late. Mair needed to make up for the lost time. Working with Dyna-Lift on the project, Panel Built went through different design iterations in order to find the perfect solution for Kinpak. The final layout offers the manufacturing facility two new restrooms, a storage area, and comfortable space. The modular office building has windows fully across two sides, providing an open view of the manufacturing floor for the offices. The building has a total of 200 linear feet of our standard vinyl covered gypsum wall panels at a height of 10’. The building’s lights, switches, and data ports were set up with our modular wiring system. With a load bearing roof, the office’s ability to store as much weight on its roof as one of our standard mezzanine systems. As for the installation, Mair was tasked with handling this project with an already reduced timetable. the remainder of the project went very smoothly for the Panel Built installation team. 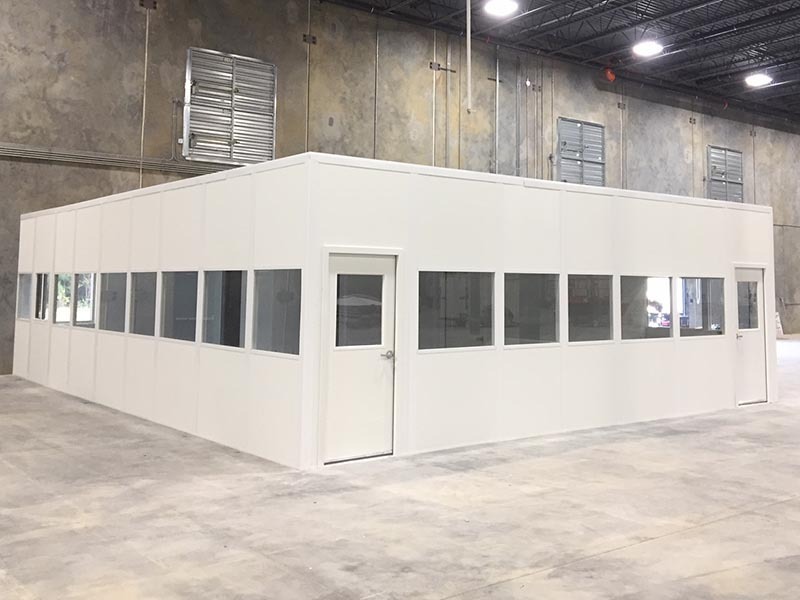 According to Mair, “One key aspect that made this install successful was the organization and cleanliness on the job site and during install.” The building was a 28’ x 36’ x 10’ interior office with a 125 psf load bearing roof and modular wiring. The building consists of our standard 3” white gypsum wall panels with matching doors and trim.